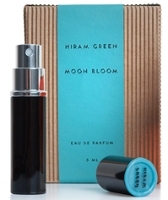 Moon Bloom launched in 2013, as the debut fragrance from Hiram Green, formerly of the now-defunct niche house Scent Systems. Like the perfumes from that brand, Moon Bloom features all natural materials. Moon Bloom is exactly what its official description says it is: "a lush and elegant tuberose". Like its (synthetic) compatriot Frédéric Malle Carnal Flower, Moon Bloom plays up tuberose's exotic aspect with coconut, jasmine, ylang ylang and plenty of greenery. It's a creamy and full-bodied white floral, richer than Carnal Flower, but not as loud about it as, say, Robert Piguet Fracas (perhaps the gold-standard of loud tuberose). Moon Bloom opens quite green and it packs some sillage, but like most natural fragrances, it ends up fairly close to the skin. Fans of ylang ylang will be happy to hear that there are lovely banana-smoothie undertones as it dries down, although the tuberose remains front and center from first spray to last gasp (and it's surprisingly long lasting: it makes it through most of a day on me). There's just enough coconut to add to the general creaminess — it doesn't smell like suntan lotion or a piña colada — and the far dry down is warm and sweet, with just enough of a spicy kick. Verdict: Perfect. If you're a tuberose fan and haven't tried this, do make an effort to find a sample, and for that matter, if you're not a tuberose fan, Moon Bloom might start you on the road to conversion. It's been a long time since I've bought a white floral of any sort, and I'm very tempted to put the travel atomizer on my buy list. Highly recommended, and I look forward to seeing what Hiram Green does next. You can find more reviews at EauMG and Kafkaesque. Have a favorite tuberose? Do comment. Hiram Green Moon Bloom is available in 50 ml Eau de Parfum (shown at top, $165) or 5 ml travel atomizer (shown just above, $40). In the US, it can be found at Indigo Perfumery (samples are $4); in Germany, it's at First in Fragrance; in the UK, find it at Content or Roullier White. Tuberose might be my favorite note and the most represented in my collection. But I have a few questions… Is moon bloom in the same wet and fluorescent green family as carnal flower? CF is my “least favorite among the favorite” tubeys. And do you know how MB compares to Vamp a NY, which is another all natural, banana-ish and resinous tuberose? Hmmm…less “wet”, because there’s no melon, but not sure I think of CF as “fluorescent” green…maybe I’m not sure what you mean? And way less resinous than the heavily-benzoin-ish Vamp. This one, for all that it does feature other floral notes, is much closer to a tuberose soliflore — it’s “about” tuberose in a way that Vamp isn’t, to me. I think you could not adore tuberose and still love Vamp, or L’Artisan Nuit de Tubereuse, this one, you’re going to have to love tuberose (or learn to love it). Thanks for all the comparisons! CF is, to my nose, neon green… Like the shade of poisons in old movies, with their dangerous green halo and vaporous tentacles. I have just sprayed some. It must be the boosted “florist shop” effect. I like it, but it is too loud and green and wet for my tastes. All the other tuberoses I own feel comforting and friendly, even Fracas (especially fracas), while CF borders on “too much”. I’m sure it’s partly the fault of the generous nozzle of the FM bottle. I like to under-apply, and I prefer dabbing when possible, but CF comes riding out of the bottle in a whoooosh of green green stems and blossoms. It’s uncontrollable. A beauty, but a difficult one…at least for me! Ah, interesting. My tolerance for green is probably pretty high. This one is very green in the beginning, but since it’s all natural perhaps it won’t strike you in the same overwhelming way. Definitely need to try this. Tuberose features in many of my preferred scents, but 2 that spring to mind are Bouquet Blanc (one of the reasonably priced Le Labos, via Anthropologie), and another natural: Narcotic Flower by 1000 Flowers. The L’Artisan one doesn’t work for me for some reason. That reminds me that it’s been awhile since Anthropologie did one of these brand mash-ups…wish they’d do another! Have not tried the Narcotic Flower…sounds lovely, and nice price. Narcotic Flower looks interesting, and as Robin says, the price isn’t bad, either. I’ve just found a shop here that carries it. I fired off an email to ask if I can order a sample or if they have a tester in the shop. Sadly, I am not a fan of tuberose. I have yet to give up though, and I suspect I will keep sampling to the bitter end! I even ordered a sample of Carnal Flower over the weekend. I do appreciate Moon Bloom quite a bit, though it’s not for me. I was pleasantly surprised by the sillage and longevity which is rare in a natural perfume that isn’t bogged down by base notes. And kudos for that travel size, too. Thus far, the only tuberose I like is Tubereuse Capricieuse by Histoires de Parfum which I discovered after reading a startling, narcotic review of it on The Black Narcissus. It is so long lasting it makes me sort of suspicious, actually! But we are clearly evil scent twins on the tuberose front. I adore tuberose, but didn’t like any of those HdPs. I’m not throwing in the towel yet! So Robin, what is your favorite tuberose? Tie: Serge Lutens Tubereuse Criminelle & Fracas. TC is, I think, weirder than Fracas, but also easier to wear, and most of the weirdness is in the top notes. If you can live through the top notes, you’re home free. Thanks! I will add TC to the sample wishlist. Yumm. Thanks for the review. Somehow the look of the bottle, the roundness and the color already pre-empt the scent. From your description, Robin, a very good look-smell match. Yes, good fit with that bottle, although I’m not a fan of bulb atomizers. Carnal Flower is my introduction to tuberose, and I am besotted with it! I now want to try other tuberose scents. I’m putting together a samples order for First in Fragrance and Moon Bloom will be included. Eek! Just looked, and it’s not listed there. I’ll check back in a couple of days and maybe they’ll have it then. Well… duh! I swear it wasn’t there when I looked. Thanks so much. No problem…I sometimes do better with google than their internal search. I find Carnal Flower a bit too insipid and Fracas a bit full-on and slightly old-fashioned altho my daughter in law loves it. Also with Fracas it does remind me of floor polish! So I’ve sent off for the 5 ml sample – not cheap but after reading the Kafkaesque review as well it sounded so beautifully done that I’ve done a blind buy. Its £26 including tax and shipping to the uk – not cheap but I’m so so fed up with all the “stuff” out there at the moment – I’m gambling to be inspired. I will let you know how I find it……..
Oh dear…well, if you hate it, you can always try swapping it for something else! Oh dear – must give samples several chances over different types of weather. Yes…I think weather and especially humidity can make a big difference! I get a very green cast to Carnal Flower as well, but I LOVE that. Grrr. My sample wishlist does not need to get longer… but it just did, anyway. Thanks for review. Yes, me too! I think it was the “fluorescent” part of Zazie’s question that I didn’t really get, if that’s what you meant. It doesn’t smell neon to me, although now trying to think of what green scents do, and not coming up with anything offhand. I can think of neon pinks though! And sorry. It never ends. I keep putting this one out of my mind and it keeps creeping back in. It sounds wonderful. I’m sure I’ll get around to testing it or blind buying the next time I have a craving for tuberose. Gosh, there is too much blind buying going on here…you guys are making me nervous! Never fear, Robin! TPC carries Moon Bloom. OMGoodness, 5ml? How could you not? CF is one of my favorites so can’t wait to try this. I am lemming this and have been lemming this since Lucas’ quick sniffs review, then Kafka’s review and now, yours! In general, I do not like flowery perfumes; however, I like Carnal Flower in moderation (my decant will last me a while although I do worry about it turning as I understand Frederic Malles don’t stand up well to time and occasional exposure). Tubereuse Criminelle – oy vey, what can I say? Despite getting turned off this every single time I’ve tried this (only on paper blotter), I kept going back until the last time sometime last year when I almost passed out with one whiff – I swore off of it FOREVER! Ack…really? If TC makes you pass out, surprised you want to try this! Moon Bloom is definitely a higher quality tuberose/white floral and it was on my to buy list, until I sampled Byredo’s Flowerhead which replaced it on my wishlist. I find them similar but Flowerhead, for my taste, is more natural and overall a better composition. It also has better longevity. For pure tuberose there is nothing better than Mona’s Tubereuse. It is, I think it’s gorgeous. Great Review! I’m adding this to my try list as well. Tuberose is difficult for me to wear but this sounds like it might be really beautiful. Can’t hurt to try. The easiest tuberose, probably, is Diptyque Do Son. I think I generally like tuberose, although I abhorr Fracas. My fav is BK Beyond Love, and I also have L’AP Nuit de Tubereuse, a decant of Vamp and various white florals that must have a lot of tuberose. I don’t have a huge hankering for another, but it’s not often you declare something perfect, so now I’m very curious to try it. It sounds like I should also try Flowerhead. Flowerhead, to me, is more of a jasmine with a bit of tuberose, but it’s very much worth trying. This is closer to Fracas than Beyond Love, so hard to say, but probably worth a shot. The only tuberose that ever worked on me was L’artisan’s original Tubereuse. Hopefully they bring it back as an LE like they did with Jour de Fete! Sadly, I hardly remember that one. There was quite a bit of tuberose in La Chasse Extreme, but I think that one’s been axed too. I fell in love with Moon Bloom when I sniffed it on a friend so I hunted down a sample to review it. It has finally made it to the US as well at a shop in Cleveland, Ohio. Living in Nashville (South/Midwest) – it is amazing to see cool niche/indie scents making their way to this part of the country – before being in New York and California! Yes, really nice that Indigo picked this one up. Hopefully it will get to other stores too. I love this and have a bottle of it. I once layered it with Houbigant Orangers en Fleurs, which made Moon Bloom shine and last all day on me. I tried this on a whim when in the Content shop and was very impressed. I love white flower frags but not always ON me. If I didn’t already have Carnal Flower, Nuit de Tubereuse, Songes and a good amount of Vamp (none of which I wear all that frequently) I’d be tempted, it’s that lovely. Great review. I recently ordered a sample of this, and I love it! I’ve been planning to wear Carnal Flower for my upcoming wedding, and now I think I’ll add a dab of Moon Bloom in the evening. It has a subtle warm spiciness that is missing from the cooler, greener CF. While CF is still my favourite daytime tuberose, I think MB could be my new favourite for nighttime. I guess the name is pretty appropriate in that sense;) It feels just a little bit sexier. Oh, that sounds perfect! Best wishes for your wedding, hope it is lovely.